Guess what I'm getting next week in the mail? Yep, an Icom IC-251E 2m all-modes transceiver. I want to explore the usefulness of VHF SSB for prepping, as opposed to FM or NVIS on lower bands. I don't think 2m USB will be that much better than FM using a high-gain Yag-Uda directional antenna, but it should still have an edge. I still think NVIS on 80m will beat anything for regional comms, but has any of you guys tried 2m SSB? What is your opinion? I dabbled in VHF weak signal a little quite a few years ago but I'm far from highly experienced, here's what I learned; antenna gain is everything, but let me explain. By antenna gain I mean total gain as in antenna height, gain of the antenna itself, minimal signal attenuation in feedline, antenna polarization, etc. They don't call it weak signal for no reason and a lot of he quick and dirty set ups commonly used on VHF FM don't work well on extremely weak signals. I wish I could find that article where Boy Scouts were camping and doing 2M work. They made a 3 element Yagi with a tree branch and some barbed wire and talked off a mountain top repeater many miles away. The rusty barbed wire on the crooked stick looked awesome. I wonder is a preamp might be useful... I need to test the rig without one first of course, and the goal is to be heard as well. I ordered a CTCSS tone board to be able to use it on the local FM repeater as well. 10W isn't a lot for weak signal VHF, but I have seen plenty of people do it on Youtube. There are tons of old 2m SSB rigs on Ebay, often for less than $100. I paid $200, but this one is in excellent shape and the model I wanted. 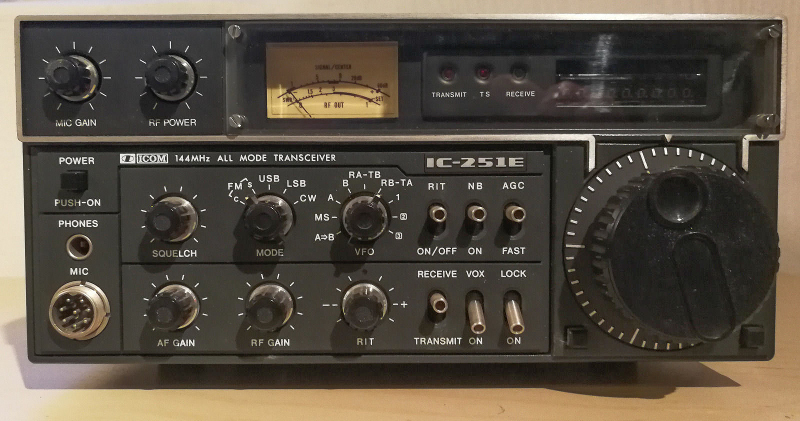 I used to have an IC-271A which I never used for SSB, what a shame, but a great radio too. I almost got the MFJ-9402 but it was going to cost me double with import taxes. I did a Google image search and that looks like a standard Molex four pin connector to me. Looks like it, yes. Thanks! A Ham friend of mine gave me the US version because it didn't work. I was able to restore it back to working order. It is a great radio. Nice looking one too Joel! I need to find an original microphone.. The one I ordered is a no-brand replacement. No contact yet but I am trying using CW since I don't have the mic yet. I did hear some SSB activity around here though. My homebuilt portable 6-el Yagi-Uda seems to work well, SWR 1.3:1, up to 2:1 at 144.7MHz. Thanks Gil, I'm rather proud of my IC-251A. I'm using it with a halo antenna right now and it seems to work very good with low SWR. I also have a small 40 watt 2 meter amp, but have not had to use it yet. I'm mostly working local SSB right now. Where did you find a CTCSS board? I would have though those would be hard to find by now. I had to completely rebuild the mic, but it sounds good now and has the DTMF pad in it. Great old radio. From Mesquite Tx to Colgate Ok is roughly 140 miles ,and to Ft Hood, Killeen is about the same. Joel, I found a board on EBay, from a South African seller. There are plenty from China. Now I need to find out where to inject the tone.. Presumably it is printed on the PCB but I haven't found it..